To show the difference between the effects of radial-expansion of fluid and fluid velocity, the author designed a simple experiment. This experiment is to blow air through two similar conduits, a tube and a cone. The cone allows the air to expand radially while the tube does not. 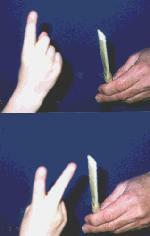 In practice the cone collapses, demonstrating that radial-expansion induces lift. The tube shows no such effect. If the Bernoulli Principle were really applicable, both the tube and the cone would collapse. Air from a vacuum cleaner exhaust port flowing through a paper cone induces the cone to collapse. 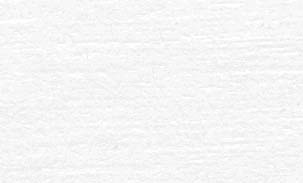 The telltale strip of paper indicates the flow of air. The common explanation for such phenomena incorrectly cites Bernoulli's Principle. Actually, the velocity of air through the cone is irrelevant. Radial Momentum fans the air out and induces lower density and therefore pressure inside the cone. The same air supply, applied through the same kind paper, this time as a tube, has no effect. 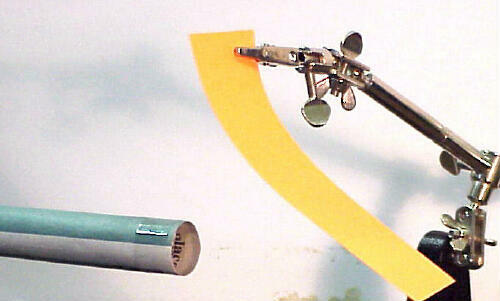 If Bernoulli's Principle (high velocity implies low pressure) applied, both the cone and the tube would flatten. Garden hoses, fire hoses and other flexible tubing would also flatten when water passed through them. None of this happens. Since the tube has parallel walls, Radial Momentum cannot develop and there is no fanning out and no density or pressure drop. This indicates Radial Momentum, not air velocity is the key to pressure drop. 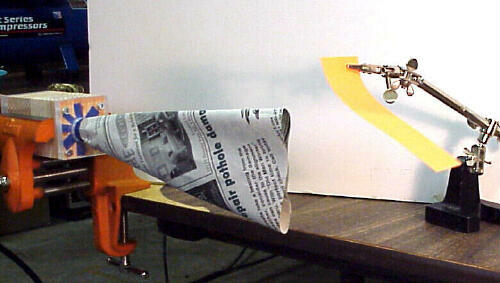 Get some soft paper, like newspaper, and make a tube about six inches long and about an inch in diameter. Also, make a cone about six inches tall and about five inches wide at the wide end and about an inch wide at the narrow end. Blow air through the tube. If Bernoulli's Principle applied, the tube would collapse since the fast air inside it would have lower pressure. The tube does not collapse so Bernoulli's Principle does not apply. Now blow air through the small end of the cone. The cone does collapse since the shape allows the air to radiate outward. The paper cone with no air applied. The telltale is to register airflow for the camera. Air applied through the paper cone causes it to flatten, indicating reduced pressure inside the cone. Note: Air flowing through a cone of decreasing radius causes no flattening. 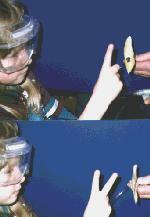 Telltale at the entrance of the paper cone, with low airflow, pulls inside the cone, indicating induced vacuum. Air flowing through a paper tube causes no flattening. A slight expansion of the tube was observed. A paper tube does not collapse when you blow into it A paper cone collapses when you blow into it. The experimenter holds up one or two fingers to signal air off or air on. The volume of a conical section of air equals the height times its average base, dVolume = pi * r2 * dh. Volume increases with the square of the radius, indicating the Radial Momentum effect. Radial Momentum induces lower pressure by radiating the fluid into sections of larger volume. Since volume is proportional to the square of the radius, density and pressure are both inversely related to the square of the radius, per: P1 / P0 = r02 / r12. For a tube, r0 = r1. Therefore, P1 = P0 and this confirms the observation that there is no pressure decrease induced by high velocity air passing through a paper tube. Contrary to popular interpretations of Bernoulli's Principle, velocity, by itself, does not induce pressure decrease. Radially expanding flow through a cone, induces pressure decrease. For an inverted cone r0 > r1, and therefore P1 > P0; air flowing into the wide end of a cone does not cause it to collapse. In practice, high-pressure compressible fluids, escaping through an orifice into a low-pressure area tend to expand, by radial Momentum, into a cone and induce even lower pressure. The shape of the cone depends on the compressibility of the fluid and the orifice exit velocity. Air tends to escape from an automobile tire into a radiating cone. Water, out of a faucet, tends to stay in a cylinder and may even taper, due to the effect of gravity to increase velocity.